Those looking for co-op multiplayer gaming excellence should look no further than this charming, addictive sequel. I never thought I’d experience a game that so authentically captures the stresses of being a chef at a bustling kitchen - or at least what I presume those stresses would be like. And yet, Team 17’s Overooked! 2 manages to capture it. I mean that in the best way possible, by the way. Taking its cue from the first entry, this sequel utilizes the ingredients of what made Overcooked so enjoyable and adds some delectable additions of its own, including online multiplayer. If you’ve played the original it likely won’t take much for you to jump right into the action and get acquainted with the frantic multi-tasking the game demands. The controls are pretty simple and only require the use of a few buttons for the main commands. Not being well-versed in Overcooked culinary arts myself, there was certainly a learning curve that I had to shake off with so much going on around me. After 20 minutes or so of stumbling around, dropping food on the floor, burning things, and falling down pits, it all clicked, and the game’s enjoyment elevated massively. Essentially, you’re tossed into one of a number of unique kitchens, complete with an array of cooking tools and crates full of food items at your disposal. You’re immediately put on the clock as you and at least one other chef must scramble to whip together a laundry list of varying dishes. You’ll often have to prepare these items by way of chopping, steaming, frying, and/or baking. The rate at which you accumulate points will depend on how quickly and orderly you assemble these items. Following completion of a stage, you’ll be awarded 1 to 3 stars, the latter of which usually requires a synchronized assembly line born of teamwork and ample communication. You can jump into either a local or online multiplayer mode with relative ease, and decide to face off in a cooking throw-down Iron Chef style, or choose to band together to crank out as many food items as possible within a 3 minute span. You can pick your chef from a number of cartoony options, both human and animal, and unlock more as you progress. 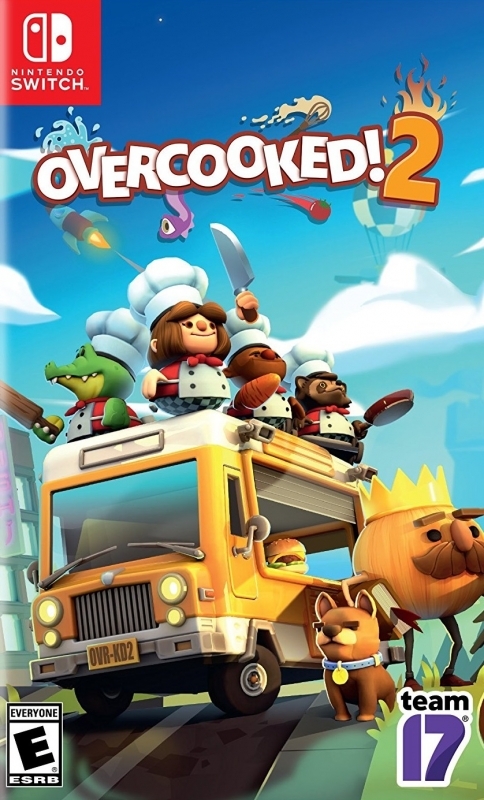 In addition to boasting a larger lineup of chefs, Overcooked! 2 also replaces the soup recipes that so heavily permeated the original and swaps them out for a much more diverse lineup of dishes. These range from sushi, to a couple of the sequel’s more elaborate additions - flapjacks and cakes. This new lineup, along with a few old classics like the burger, keep the experience feeling fresh, as most of the food items come with their own separate process for cooking and preparation. While the game revolves around a pretty simplistic core, there are certain nuances you can exploit in order to run your kitchen more efficiently, which can go a long way in nudging over the 3 star cliff. You can allocate various tasks to certain players, such as dish washing or serving, and can choose to fulfill orders in the order they pop up to receive extra tips. You can now even toss food items directly into the arms of an awaiting chef or into a pot or pan to save on time. Overcooked! 2 mostly hits that sweet spot of solid mechanics and simplistic gameplay that’s easy enough to grasp, but provides room for completionists and die-hard chefs to shine and earn that triple star ranking. The game comes with a pretty standard campaign mode that gives you a quick tutorial before plopping you onto an overworld map containing a number of colorful kitchens, each with their own characteristics, equipment, and hazards. You’ll be cooking in everything from sushi kitchens wrought with conveyor belts, to pit-laden coal mines, to hot air balloons that force you to scurry across moving platforms. Some of these stages go a tad far in tossing random elements at you, but most add a certain charm and do well in keeping you on your toes in a creative, chaotic way. The variance in the environments also helps the game’s cute and colorful art style flourish even further, giving a delightful sense of character. The campaign comes with a simplistic, but nonetheless amusing narrative involving the cheekily named “Unbread”. Yes, as you might imagine, these are zombie-like bread creatures, and they’re apparently taking over the Onion Kingdom. Naturally, you’re summoned by the great Onion King - who looks exactly as you’d expect - to keep the hordes at bay by satiating their hunger. The difficulty stays at a manageable level - even when playing solo and painstakingly forced to swap between 2 chefs - and ramps up pretty steadily throughout. The game also does a nice job of providing new recipes and gameplay elements at an easy-to-absorb trickle, so the mode proves a fun and useful 5 hour diversion, though the real meat of the gameplay lies in the local and online multiplayer. Local multiplayer was a blast in my experience, and felt as much a couch co-op game as an exercise in communication. My matches were filled with people shouting commands and recipes at eachother, frantic moments of exhilaration, and plenty of laughter-beckoning blunders. The online play doesn’t quite offer this same charm, nor the ability to talk directly with one another on the Switch version, despite being enjoyable in its own right. Thus, despite this newly included online multiplayer feature, couch co-op still stands out as the highlight of the game and the best way to experience Overcooked! 2. Aside from the lack of communication options (basic emotes notwithstanding), I had a surprisingly smooth and endlessly enjoyable experience playing online. Players usually were on the money with tasks and there was a fair degree of working around the lack of communication through quick wits, improvisation, and multi-tasking. I was usually matched up quite quickly, and only got an occasional bit of lag stutter. The head-to-head mode is ideal for the competitive types, but for my money, the more simplistic Arcade co-op portion proves a perfect blend of action-packed intensity and mindless cooking fun. Playing with 3 others can occasionally get chaotic, but it's certainly preferable to managing multiple tasks on your own. The online could perhaps have been fleshed out a bit more, as its customizations are limited and there’s no leaderboard to be found. Still, it works well enough, and goes a long way in extending the game's shelf life. The original Overcooked managed to be something of a sleeper hit and its sequel further reminds us why this quirky co-op franchise has won over so many. Ghost Town Games and Team 17 have sprinkled in just the right amount of new elements to strengthen and further flesh out the experience without overwhelming it. While your levels of enjoyment playing solo are likely to be tepid, those looking for co-op multiplayer gaming excellence should look no further than this charming, addictive sequel. This review is based on a digital copy of Overcooked! 2 for the NS, provided by the publisher.